Can Dusty add a 'snout' to the trophy room? 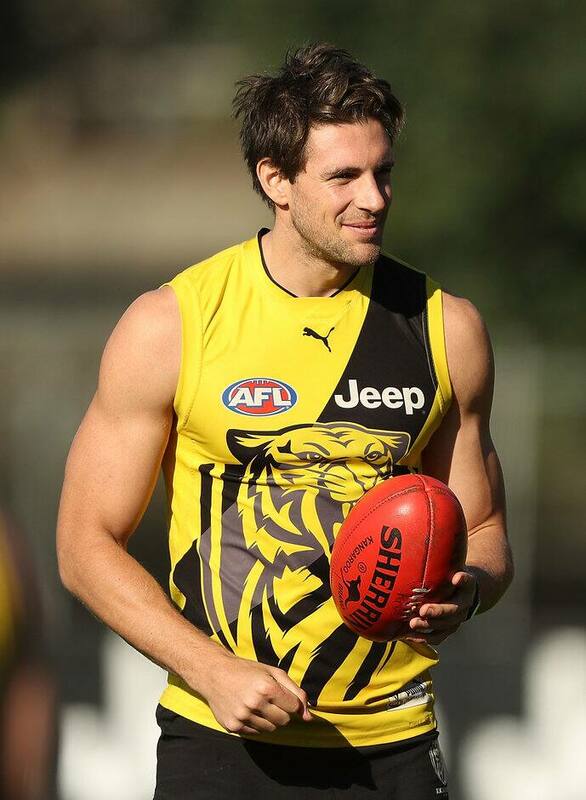 RICHMOND is positive about Shaun Hampson's ability to manage a back injury through 2018, raising the prospect of ruckman Toby Nankervis moving into a taller forward line as the reigning premiers keep the competition guessing. Meanwhile, midfielder Anthony Miles is using his return from shoulder surgery to build his running power and become a regular member of the Tigers' best 22 after missing last year's finals series. Richmond has just completed a gruelling six-day camp on Queensland's Sunshine Coast, mixing a series of highly contested training sessions in the humidity with team-building activities such as paintball and water-skiing. Hampson is among a small group of Tigers on modified training as he manages a back injury that restricted him to six VFL games last season and will need attention for the rest of his career. Football manager Neil Balme said the Tigers understood Hampson's injury would require constant management, but they were positive about his prospects of playing senior football in 2018. "We're pleased with where he is. Most of what he does is relatively modified, but he's just trying to get himself fit enough so he can play, which he's doing relatively well," Balme told AFL.com.au. "He's looking after himself well, but backs are backs, they don't just go away. "We’ve got to be careful with his ground ball stuff, just to make sure we don't put too much stress on him. "But he got through last year probably better than we thought, so we're quite positive about it, as is he." With Ben Griffiths struggling with concussion in 2017 and no obvious replacement, Richmond deployed a small forward line that has been recognised as a key element in their premiership success. The availability of Hampson, however, has convinced forward line coach Justin Leppitsch to explore a more traditional forward line with Nankervis rotating in as a second tall alongside Jack Riewoldt. Nankervis was recruited by the Tigers as a ruckman/forward from Sydney at the end of 2016 after booting 19.7 in the NEAFL, but Hampson's injury in 2017 meant he held down the No.1 ruck spot all season, spending very little time in attack. Elsewhere in the Tigers' medical room, Miles is still on a modified program following post-season shoulder surgery. The inside midfielder, who explored a trade at the end of 2017 to get more senior opportunities, is using the pre-season to improve his running game. "Not being able to be in contested drills has allowed me to work on my running more so than I have been able to in the past," Miles told the club's website. "The fitness staff and the conditioning staff have been great in allowing me to do that." Miles finished sixth (2016) and fourth (2015) in the Tigers' best and fairest in the two seasons leading into the club's premiership year, but a lack of midfield injuries and the recruitment of Josh Caddy and Dion Prestia squeezed him out of the team in 2017. The 25-year-old produced brilliant VFL form and broke into the senior team in rounds 17-20, but after finishing the year in the VFL he explored his options before signing a one-year extension with the Tigers. "Obviously I'd love to be playing AFL footy and I know the competition for spots is going to be tight, so I'm continually giving myself the best chance to be playing," he said.